Lamarck bequeathed a huge legacy to the biological sciences but in the English speaking world in particular this is often not fully appreciated. The reasons for this are many and complex: only a summary can be given here. His ideas originated in Enlightenment thinking which had begun to question the Christian interpretation of the natural world. The results of the study of geology had shown that the Earth is a great deal older than the 6000 years as described in the book of Genesis, and the recognition that fossils represent the preserved remains of dead organisms towards the end of the eighteenth century meant that some people had started to accept that species were not fixed and could become extinct. The most extreme of the radical Enlightenment thinkers even called into question the existence of or need for a Deity. These materialist ideas, which horrified many Christians, were discussed freely and openly in post-revolutionary France where organised religion had ceased to have any formal power. Lamarck was a Deist who believed that once life had been created, it developed according to natural laws. In Britain Lamarck soon became associated with Erasmus Darwin who had popularised the chemical origins of life and evolution in the late eighteenth century. Darwin was also remembered for his support for social and political reform. The idea that more complex organisms had evolved from simpler ones was popular amongst democratic reformers in Britain and elsewhere because it challenged the view of the ruling elites that the world had been created by God and was unchanging and that order was imposed from the top downwards. Christian theologians considered that the ideas of Lamarck and Darwin were materialist and atheist threats which if accepted would have brought the social upheaval and chaos which had afflicted France in the early 1790's. The monarchies of Europe actively suppressed any sympathisers for democratic change in their own countries, while at the same time they formed coalitions in an attempt to restore the French royal family to power by force of arms. Christian and conservative monarchists and materialist and radical democrats continued to use their very different interpretations of the natural world to support their political and social values for much of the nineteenth century. Lamarck was was unpopular with many of his colleagues at the Musée de Histoire Naturelle where he worked: in particular he disagreed with Cuvier over the fact of evolution. Cuvier was another gifted biologist and geologist who was professor of vertebrate anatomy and palaeontology and head of the museum, and a brilliant speaker and sharp political operator. When Lamarck died Cuvier gave a funeral oration that was so denigrating that it was not published. 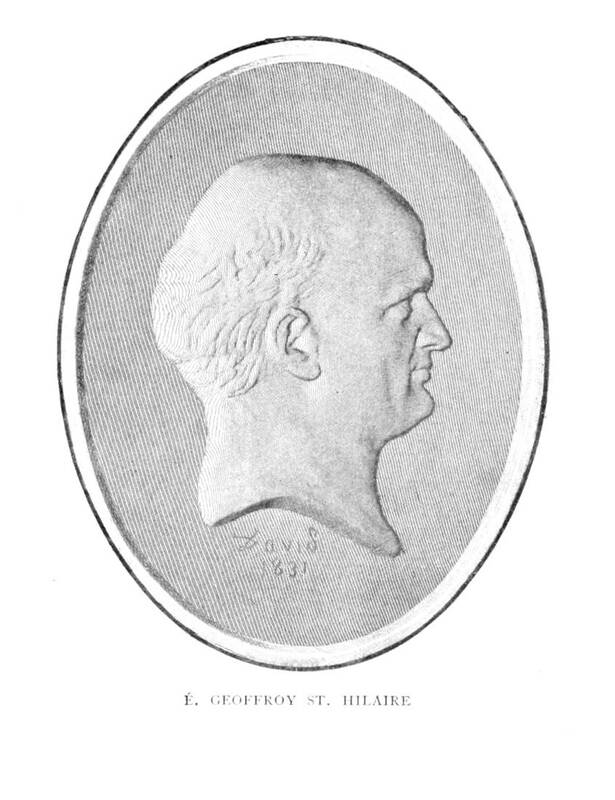 Lamarck's reputation was defended by his friend and colleague Geoffroy St. Hilaire but he too had little support among the staff in the museum and soon found himself as isolated as Lamarck had been. In early spring 1830 Geoffroy and Cuvier held a series of public debates about evolution which emphasised the fundamental differences of approach of the two men to science, with Geoffroy arguing the case for evolution from a broader understanding of nature, and Cuvier opposing evolution and claiming instead that the proper role of the scientist was to describe the natural world in ever greater detail. The arguments became extremely arcane but there could be no disguising the very different unspoken political messages that each side conveyed to the audience: Geoffroy in favour of democracy and progressive social change and Cuvier for central authority and monarchy. The politics of evolution spread beyond the museum when Lamarck's and Geoffroy's ideas were used by revolutionaries during their protests against the reactionary regime of Louis XVIII. In May mobs rioted on the streets of Paris and the king fled to Britain. A young Scottish aristocrat, Charles Lyell, was present when the Geoffroy - Cuvier debates took place and the revolution broke out. He was appalled and frightened by what he saw on the streets of the capital and only escaped with his life by being sheltered in a friend's house. Later in 1831 during the British parliamentary reform crisis, Lyell's sisters had their carriage stoned by an unruly London crowd who were also using Lamarkian ideas in support of their demands for political reform. In response to these experiences Lyell devoted the first 6 chapters of volume 2 of his Principles of Geology to attack and discredit Lamarck and his evolutionary theories to neutralise or discredit the scientific arguments of the reformists. "inquire, first, whether species have a real and permanent existence in nature; or whether they are capable, as some naturalists pretend, of being indefinitely modified in the course of a long series of generations? Secondly, whether, if species have a real existence, the individuals composing them have been derived originally from many similar stocks, or each from one only, the descendants of which have spread themselves gradually from a particular point over the habitable lands and waters? Thirdly, how far the duration of each species of animal and plant is limited by its dependance on certain fluctuating and temporary conditions in the state of the animate and inanimate world? Fourthly, whether there be proofs of the successive extermination of species in the ordinary course of nature, and whether there be any reason for conjecturing that new animals and plants are created from time to time, to supply their place?." (Principles of Geology Vol 2, p1-2). "We must here interrupt the author's argument, by observing that no positive fact is cited to exemplify the substitution of some entirely new sense, faculty, or organ, in the room of some other suppressed as useless. All the instances adduced go only to prove that the dimensions and strength of members and the perfection of certain attributes may, in a long succession of generations, be lessened and enfeebled by disuse; or, on the contrary, be matured and augmented by active exertion, just as we know that the power of scent is feeble in the greyhound, while its swiftness of pace and its acuteness of sight are remarkable—that the harrier and stag-hound, on the contrary, are comparatively slow in their movements, but excel in the sense of smelling. The cameleopard was not gifted with a long flexible neck because it was destined to live in the interior of Africa, where the soil was arid and devoid of herbage, but being reduced by the nature of that country to support itself on the foliage of lofty trees, it contracted a habit of stretching itself up to reach the high boughs, until its fore-legs became longer than the hinder, and its neck so elongated, that it could raise its head to the height of twenty feet above the ground" (9-10). < p class="lq"> "Nature, we are told, is not an intelligence, nor the Deity, but a delegated power—a mere instrument—a piece of mechanism acting by necessity—an order of things constituted by the Supreme Being, and subject to laws which are the expressions of his will. This nature is obliged to proceed gradually in all her operations; she cannot produce animals and plants of all classes at once, but must always begin by the formation of the most simple kinds; and out of them elaborate the more compound, adding to them successively, different systems of organs, and multiplying more and more their number and energy. In chapter 2 Lyell presented an extended discussion of the immutability of species, of how species may vary considerably, especially if domesticated, but that there were distinct limits to the amount of change that was possible and new species were not and could not have been formed in this way. Lamarck and Darwin had not been able to show by analogy that speciation could occur by natural selection or by variation in different environments so their arguments for change were wrong. Subsequently Principles of Geology became an important volume that was used by the Anglican politico-religious establishment in Britain to justify their view which strongly opposed ideas about evolution and the political movements associated with it. Lyell did not provide any evidence to support his counter-argument because in his opinion as a lawyer, this was not necessary, he had only to show that the opposition's case was unproved. By this clever and subtle method he was able to reassure those who agreed with him that they were right. It was not science, but it was effective. In Scotland Lamarck's theories were taken up and popularised by a group of radical teachers such as the comparative anatomist Robert Grant, the surgeon Robert Knox, and Robert Jameson, Regius Professor of Natural History at Edinburgh University. Knox and Grant taught in extramural medical schools in Edinburgh, and later in London. While he was in Edinburgh studying medicine in 1826-7 Charles Darwin worked with Grant on sponges and other marine invertebrates and was introduced to Lamarck's methods of classification and ideas about evolution. Grant, Knox and Jameson were not just passing on the latest and best anatomical knowledge of the day to their students, they were advocating a materialist, atheist world view and using it to further the cause of democratic reform. When Grant was elected to the committee of the prestigious and influential Geological Society of London he soon clashed with the clerics and gentlemen geologists who made up the rest of the committee and bulk of the membership. Darwin, who was on the committee at the time, was deeply disturbed by both the fiery nature of Grant and his attempts to push for reform of the society by making it more democratic and open to a wider membership. The reaction of the conservative clerical and gentlemen scientists in both France and Britain to what they perceived to be the materialist and atheist Lamarckian threat to the social and political status quo, was to try to prevent science from being used by the radicals, while covertly retaining it for their own purposes. To this end a group of gentlemen and clerical scholars established the British Association for the Advancement of Science in 1830. The avowed purpose of this organisation was to take control of the publicising of the latest scientific discoveries among the artisanal and middle classes by holding annual meetings in the larger towns and cities of Britain outside London. This "Parliament of Science" was to promote an Anglican version of the natural world which was presented as being "neutral". Its critics, including Jack Morrell and Arnold Thackeray viewed it very differently, in their eyes it was there to guarantee "God's order and rule" and foster "national identity, common commitments, and a continuous acceptance of the leadership claims of traditional rulers". William Whewell who was an Anglican cleric at the University of Oxford invented the term "scientist" in 1833 to project the image of an unbiased observer who would study "neutral" nature for evidence and report his findings to the scientific community in particular and the public more generally. No mention of Lamarckism, evolution or the "crazy humorist" supporters of phrenology were ever to be allowed at the meetings, quite the contrary in fact. The reverend Adam Sedgewick, first professor of geology at Cambridge University, preached to colliers at Newcastle on the geological, economic and moral basis of the contemporary social order and inequalities in society in 1847, while William Wilberforce, bishop of Oxford preached a sermon at Oxford attacking what he believed to be the ungodly and unscientific ideas about evolution in Vestiges of the Natural History of Creation when a BAAS meeting was held there in 1846. In France the reaction of members of the Natural History Museum and medical schools was to suppress any overt connection between their scientific work and political discussion of the kind that had culminated in the Geoffroy-Cuvier debates. In France as in Britain, from the early 1830's only those ideas which conformed to the social and political norms of the gentlemen scientists and academics would be recognised as true science. One of the more important publicists of Lamarckism in Britain in the mid-nineteenth century was Robert Chambers who with his brother William, owned a very successful publishing house in Edinburgh. When in 1844 Chambers had his Vestiges of the Natural History of Creation published anonymously by John Churchill in London, he did so in order to protect both his his name and business because he knew that there would be a very strong reaction against his book and its contents from the Anglican-political establishment. Chambers had realised that there was potentially a large readership which was interested in the latest discoveries in science and was sympathetic to both Lamarck and the political causes with which his name was associated. He was right: Vestiges was an instant publishing success which brought to the attention of the public the most recently available evidence for evolution from the cosmic to the local scale in a manner that obfuscated the link between radical politics and science. Although the book received a storm of criticism from the conservative press and many clerics, this only served to give the book publicity and to increase sales. It had reached its 11th edition by 1860 by which time over 2500 copies had been sold, many to libraries where readers who could not afford to buy a copy could nevertheless still read it. Even by 1890 the number of copies of Vestiges sold matched those of Origin of Species. One young reader of Vestiges who was to become a very important populariser of the idea of evolution in the second half of the 19th century was Herbert Spencer who started to write books and articles in the early 1850's. Spencer was also influenced by the theory of natural selection which he had read in Erasmus Darwin's Zoonomia and poetry, and he combined these with Lamarck to argue that competition for survival was a major factor among organisms: he coined the phrase "survival of the fittest" which he believed best described the "natural" state of the world. It is no coincidence that Spencer was also a strong supporter of democracy, free trade and a meritocratic society, and that his ideas should reflect his view of the world as a place where competition ruled. Spencer had enormous publishing success in the United States of America where his ideas reflected and for some justified, the free-wheeling capitalist ideals of the late nineteenth century. Charles Darwin was greatly influenced by Lamarck, considering him a "lofty genius" when he had started thinking about evolution in 1839, although later he tried to deny that he had taken many of his ideas from the Frenchman. In fact Darwin increasingly used Lamarck's theories after 1860 because he was unable to find evidence to support alternative processes which could cause changes in the living world. In spite of Lyell's criticism of Lamarck's method of argument, Darwin used a very similar approach. He also attempted to use examples of domesticated species as an analogy of how in the wild variation could ultimately lead to new species as organisms had to adapt to new circumstances. His texts are full of vague appeals to causes of change without him ever specifying what they were other than the "tendency to vary". He used many examples in his writings which were drawn from Lamarck's works and those of his grandfather, and his suggestion that humans had evolved originally in Africa was an obvious conclusion drawn from the anatomical similarities between chimpanzees and man as Lamarck had recognised in 1815, and others such as Lawrence and Huxley since. Darwin went to great lengths to deny that evolution was in any way progressive: for him it was utterly random and directionless. By adopting this approach he was trying to remove any political messages that others were trying to read into evolutionary theory, and in doing so to separate evolution from radical or conservative politics. This is one of the few clear differences which can be made between Charles Darwin's theory of evolution and that of Lamarck. Lamarck's theories of evolution were accepted by the majority of biologists in the second half of the century but he was criticised again in the early 1880s by the Prussian professor at Berlin University, August Weissman who denied that the environment could have an influence on the development of an organism. He argued, without any supportive data, that information controlling changes in organisms had to come from the newly discovered nucleus of the cell: it could not travel in the opposite direction. This was another overt attempt by a conservative scientist to use science in support of politics, in this case the autocratic government in Germany. The underlying political implications of evolutionary theory were therefore as real for some people in the later decades of the nineteenth century as they had been at the beginning. In spite of Weismann, by the end of the nineteenth century Lamarck's ideas were still the most popular explanation of evolutionary processes among scientists. In the twentieth century Lamarckism went into decline in Europe and North America with the discovery and better understanding of genetics. Some reputable scientists carried out experiments which they claimed showed evidence for Lamarckian processes including the influence of the environment on organisms and the inheritance of acquired characteristics. These were controversial at the time and have remained so since but little work has ever been done to prove or refute the results of the original experiments, particularly those of the Austrian biologist Paul Kammerer and his work on salamanders and limpets. Darwin's theory of natural selection underwent a revival with the combination of genetics and natural selection in the late 1930s and early 1940s to form neo-Darwinism, or the new synthesis, which meant that for most biologists Lamarckism fell into disrepute. In Russia the opposite occurred under the influence of Trofim Lysenko, who argued that he could make wheat grow in cold environments by planting the seeds of plants which had been subjected to low temperatures. In Stalin's Russia this offered a radical alternative to what was regarded as the individualistic and capitalistic based science of the west, thus replaying in part the political arguments of the preceding century. Lysenko was shown to be a fraud and rapidly fell from favour after the death of Stalin in 1954, causing more damage to Lamarck's name and reputation. In recent decades research has started to reveal that information can pass from the cell into the nucleus and cause changes in the adult which is then inherited by the offspring, and that mitochondrial DNA (mDNA) which is inherited from the mother can act as a vehicle for the transmission of changes from mothers to their offspring. It is also becoming clear that the processes in organisms that lead to changes between generations are vastly more complex than many geneticists have recognised and that environmental factors may influence the manner in which organisms evolve, although not necessarily in the ways in which Lamarck originally suggested.